One of the most frequently asked questions that I receive about some of my roofing techniques is "How do I get the patina to look so good on the copper roofing?" This is an easy answer, I use real copper sheeting. Yes, I know that there are lots of paints and products to simulate the patina copper look, and I do use some of those techniques for small projects and details. But, for the roof, which is so prevalent on a model structures, nothing is as good as using the real thing. So, then you ask, how can I get the very thin (0.003") copper sheeting to stick without globs of message glue causing the copper not to lie down flat?? Well we are here to tell you that all your dreams are answered with this one single product, Doctor Ben?s Super Sticky Adhesive. Yep, this stuff is so sticky, that you may have a tough time getting things back apart if you apply as we suggest. That is the down side of this great product. The up side is that this adhesive is made of the very same glue that is used to apply used car decals (you know, the decals that you see on the back of cars that nearly require an air chisel to remove them). I useour Doctor Ben?s Super Sticky Adhesive to: glue metal to plastic; glue wood to wood; cardstock to plaster casting; scale people to scenery (cannot be loose) and so much more. I have used this product to apply my signature ?ribbed copper standing seam roofs for years, & I have yet to have a roof to come off?even setting out in the sun! How about applying Campbell?s shingles without wetting them with water & never have another warped roof! Copper Patina Instructions: There is a couple of different ways that you can apply the copper sheeting for either the flat look or the standing seam look. 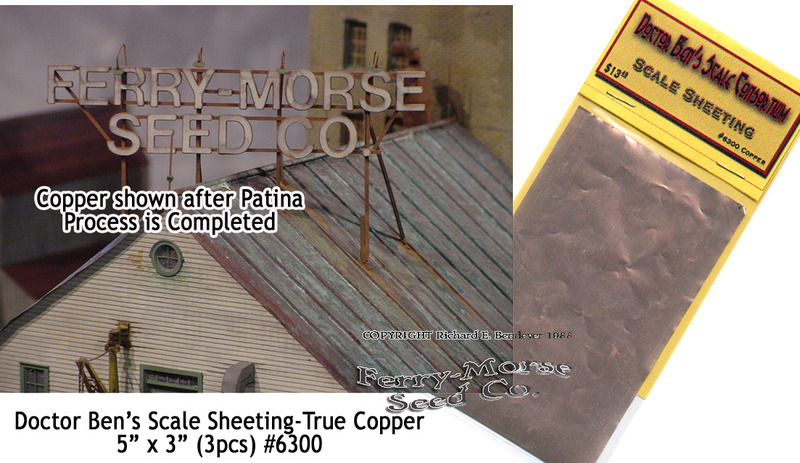 Either way, you have to do the following or your copper sheeting will NOT turn a patina. Think of the copper patina as the rust on steel-you cannot have either without oxidation. No one tells you that the clean, copper sheeting has a very fine film to prevent it from turning patina! This is how you get the copper to turn patina. Begin by wiping the copper sheet with Isopropyl Alcohol (70%) & allow to dry. If you have those little alcohol wipes, wipe the surface clean. You can't see the finger prints that you have left on the sheet but the alcohol takes of the oils. You can hurry the drying process along with a hair dryer. Next you need a scotch-brite pad (preferably the reddish color for metal) and burnish/scrub the copper sheeting in on direction and not up/down and left/right. And be sure to do this burnish/scrub process in the direction that you plan on applying the copper sheeting. In other works, you do NOT want the burnings marks perpendicular to the dirstion that the copper sheeting is applied to the model. Next, un-roll the Doctor Ben?s Super Sticky Adhesive measuring out how much you need for a single application across the surface of your material and then cut enoughstrips to cover the material from bottom to top. It doesn?t hurt to let Super Sticky Adhesive hang over the edge a 1/32? or so. You will cut this off or fold it over later. Apply the one of the piece(s) of adhesive that you?ve cut for this application and with the sticky side down on the surface of your material, burnish the adhesive down using the protective waxed paper. When you begin to apply the second, third or more strips you do NOT need to overlap. All that is necessary is to rest the second strip of Super Sticky Adhesive up against the first piece and continue the same until you have the area covered that you are working with. Then peel off the protective paper and start gluing. If you peel of the protective wax paper after each strip is applied, you may lose the reference line of where the previous strip ended and unintentionally overlap the adhesive. The only concern about overlapping is wasting the Super Sticky Adhesive. Overlapping the adhesive will not show through the material that you are gluing together. If you make a mistake and the material that you are applying is very thin, try to strip it off and reapply the Doctor Ben?s Super Sticky Adhesive. Being careful to to touch the prepared copper strips with you bare fingers, now apply the strips of prepared copper sheeting to where the adhesive is in place. Use a soft piece of wood or cardstock to press the copper sheeting to the adhesive. After you have the copper sheeting in place, you can use acidic products such as vinegar and commercially available A-West 'Patina It' to activate and speed up the patina process. You may have to wash several acidic applications to motivate the patina and you can hurry this process along by drying the wash with an old hair dryer. As always, when in doubt, ASK!